Had some hot fishing recently so I wanted to get this out there before it cools down (not the weather, I think that’s here to stay). Last Saturday I fished with David Brown and his eight year old son Owen. It was a beautiful day, but with a bit of wind. Owen said he was game so we made the long trek to the western side of Tangier Sound and points south. 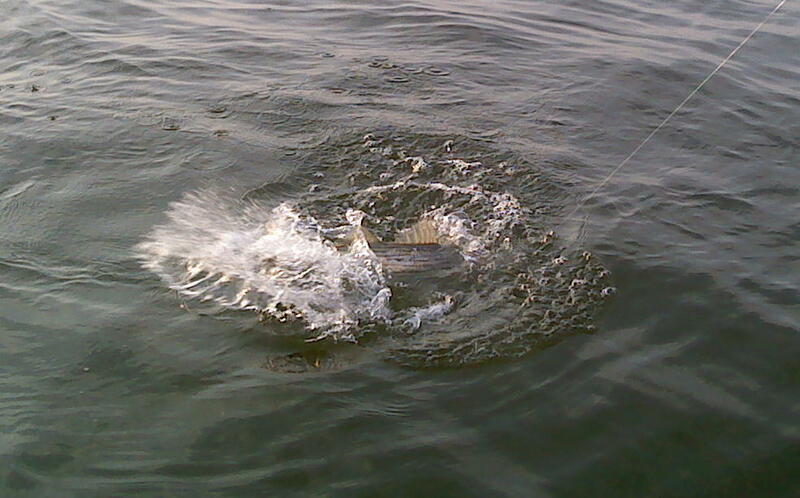 As we began casting shad tails on quarter ounce jig heads the fishing was not exactly what you would call fast. After some searching, with just a fish or two to show for our efforts, Owen latched on to something big and fought it like a seasoned pro. It was touch and go for awhile, but Owen gained the upper hand and after a good battle he managed to bring the fish boatside. 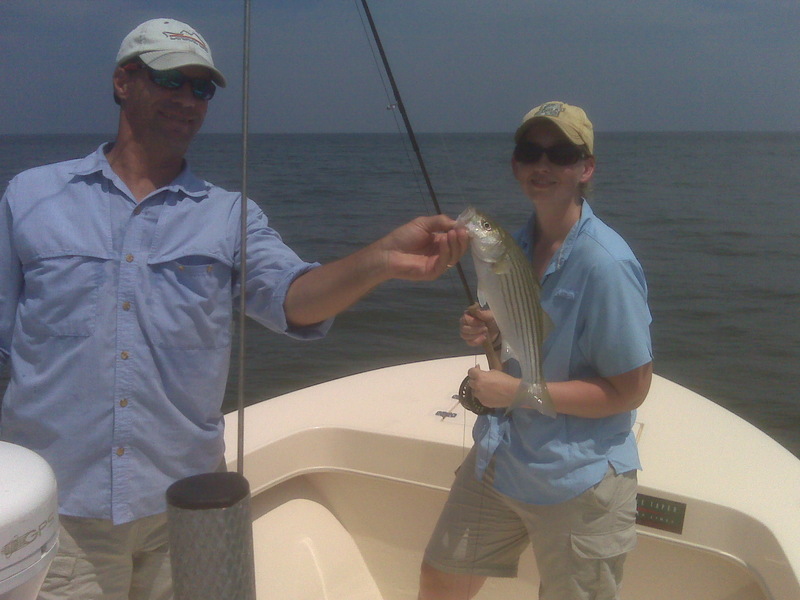 It was a beautiful seven pound striper! Way to go Owen!! After a few quick photos we released the fish to fight another day. 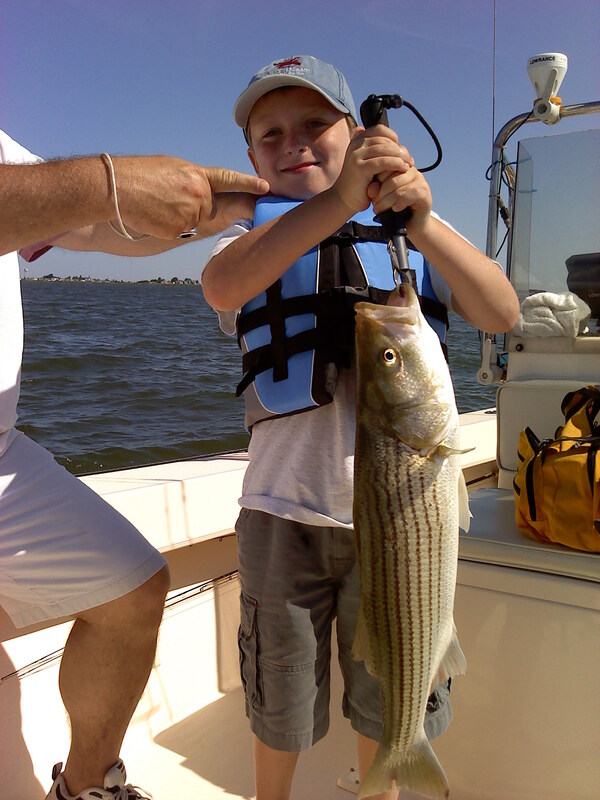 We quickly caught a few more stripers but Owen’s fish took top honors for the day. It was a half day trip so we made it back to the dock in Crisfield just in time for lunch. Yesterday’s trip was one for the record books! Steve Evander booked a trip to catch some of the 2 – 4 pound bluefish that we have been battling while fishing in the main bay west of Smith and Tangier islands. I suggested we start early to see if we could have some fun casting poppers to rockfish in the shallows before we head out into the bay. And fun we had! The very first fish came on a Storm Chug Bug popper and yanked the boga down to the 12 pound mark! 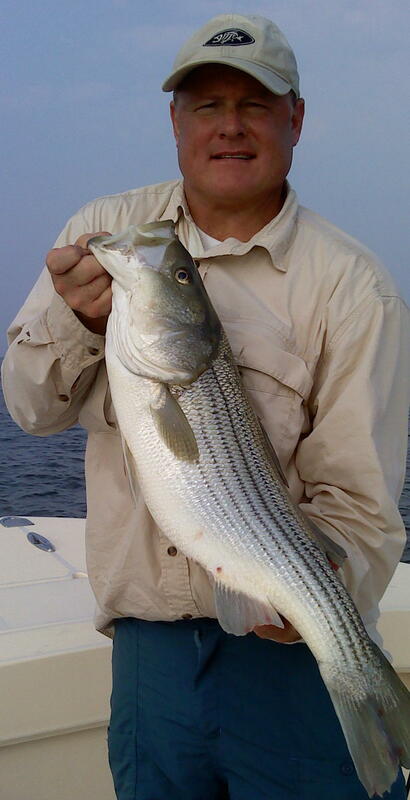 Not bad for a mid-summer striper on light tackle. That would have made most anyone’s day but Scott wasn’t finished. He proceeded to watch as big stripers slammed that Chug Bug all over the place. Fish after fish came to boatside and most all were in the 5 to 10 pound range. We both commented that it was just like fishing on the Susquehanna Flats! All this occured in five feet of water. Sorry to say the blues never really turned on later that day, but after the morning we had no one seemed to notice. We’ll get them next trip. 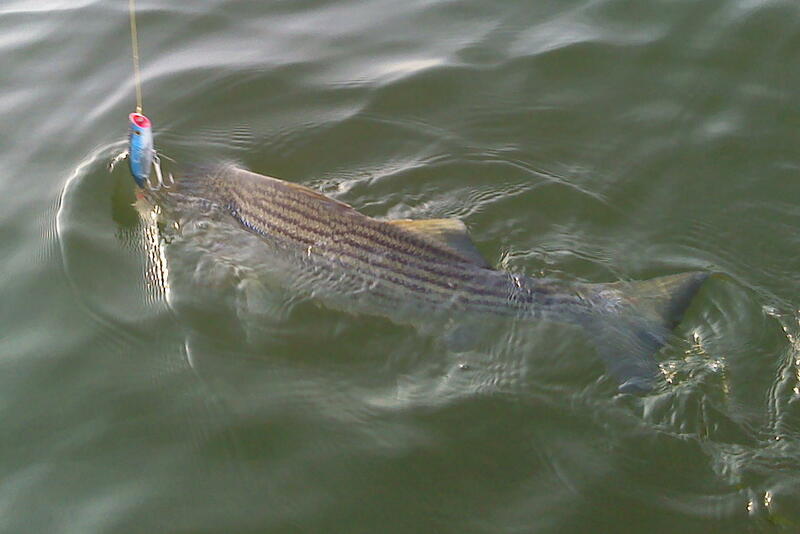 We have been enjoying some super topwater action on nice-sized stripers for the past three weeks. There are also reports of more breaking bluefish and rockfish in the mid-bay so fishing is starting to come around nicely. Don’t forget the Little Choptank six hour trip deal for just $300. Four hour trips out of Crisfield for the same price. Just a short report this week to let you know I’m still alive and well. 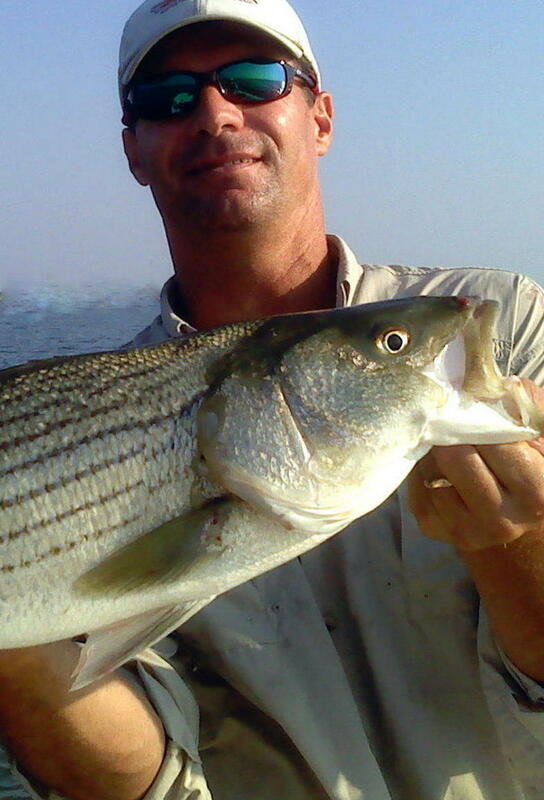 The striper fishing has definitely become a low-light deal. 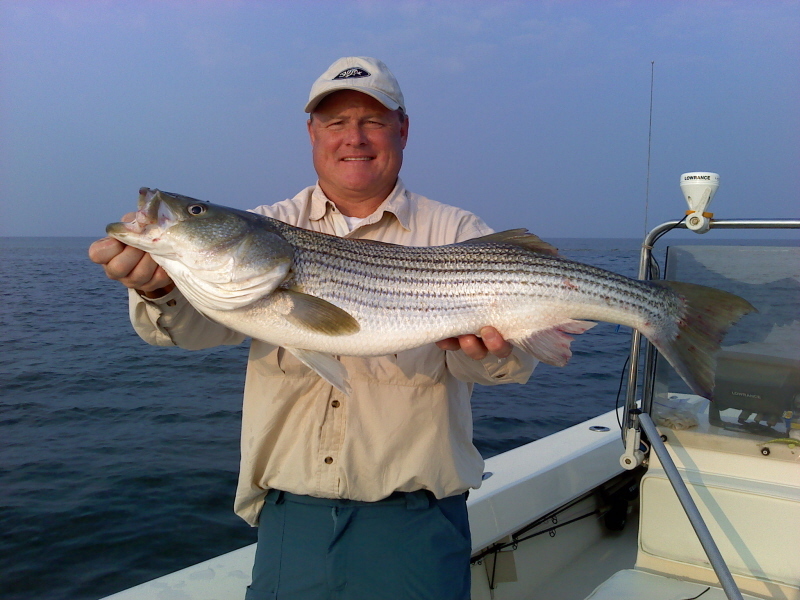 Early morning and late evening has produced rockfish in the shallows casting poppers and plastics, There are a few spots where you can catch them all during the day if you have clean water and a good current. Not taking many pictures due to the very warm water and stress this puts on the fish. Please take care to release them gently and quickly this time of the year. Had an evening trip last night and the rock were feeding on large schools of silversides and baby bunker. Didn’t get the first smack on a popper until 7:45 PM. Late or early is definitely the name of the game for topwater. Nice fish though. Bait was so thick the water looked like silverside soup!! Will try to get some pics of the bait with my polarized lens so you can see just how thick these schools are. Like a grocery store for the stripers. Bluefish can still be had in the main bay off Smith and Tangier Islands. Look for signs of surface activity. The blues will sometimes feed all day, as sunlight doesn’t seem to bother them. Some big croaker are around deepwater structure and more flounder are moving in.